At the Goldberg Clinic we see patients with chronic skin disorders of many types and yet we never “treat” skin conditions. Rather than treat the outside layer of the body (the skin) as is commonly done in medical and alternative approaches, we seek out and address causal factors responsible for a patient’s impaired health. It is rare to find a patient with chronic skin problems who does not also have other complaints as well. Indigestion, fatigue, constipation, diarrhea, gas, bloating, depression, lack of appetite, insomnia, headaches, migraines, arthritis, muscular pains, back aches, irregular menses and allergies are all just a few of the many complaints we find that accompany a variety of skin disorders. It is in determining what the functional causes of these problems are and in addressing them that serves us best in laying the ground work for returning the skin as well as the entire body to good health. We applaud Dermatologists for identifying skin cancers and other pathologies and in executing surgical procedures such as the removal of warts and other growths.The Goldberg Clinic does not offer any form of medical diagnosis or treatment for skin disorders or any other medical condition. We strongly encourage all patients with chronic skin problems to seek the advice of their family practitioner, internist or dermatologist prior to or in conjunction with consulting us. While many skin conditions respond favorably to bio-hygienic/nutritional reform it is prudent to also have a medical evaluation to rule out any serious underlying medical pathologies. In most cases patients consulting us have been to a medical physician prior to seeing us for medical treatments. Throughout our patient handouts and literature we make clear that the Goldberg Clinic does not “treat” skin disorders of any type…yet by improving the general health of the body and addressing underlying nutritional and lifestyle issues many patients find that their skin problems greatly improve. The important message to convey to those with dermatological afflictions is that most chronic skin problems are issues that go more than “skin deep,” and should be addressed in more than a superficial manner. The skin is reflective of the general state of health and well being of the body. It is a mirror of our vitality and body wide efficiency. The skin is nourished by the same blood that is circulated to all the other tissues of the body and relies on the same organs and glands of the body (e.g. the GI tract, the immune system and the endocrine system) for its well-being. Everyone is unique no matter what the diagnosis is. A thorough history, physical examination, and appropriate functional laboratory testing, including nutritional/biochemical analysis will help identify the specific features about you that can be crucial to your recovery. "Skin Deep? 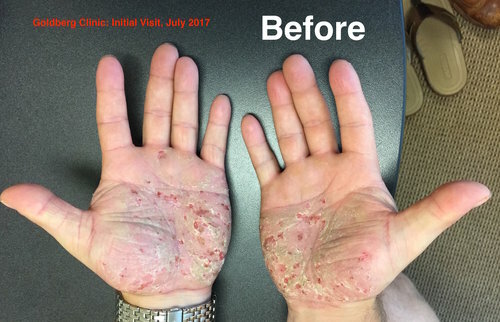 A Closer Look at Dermatological Issues"
"Chronic Skin Conditions: A Mirror of our Internal Environment"
Nick came to the Goldberg Clinic in July 2017 suffering from Psoriasis, digestive issues and back pain (see patient history). He had previously seen a number of Medical Physicians including Dermatologists who prescribed drugs including Enbrel. His condition worsened over time. 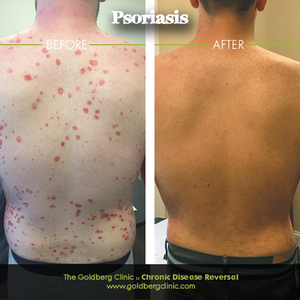 After six months of care at the Goldberg Clinic, his Psoriasis has cleared, his digestive issues have resolved and his back pain is significantly improved. 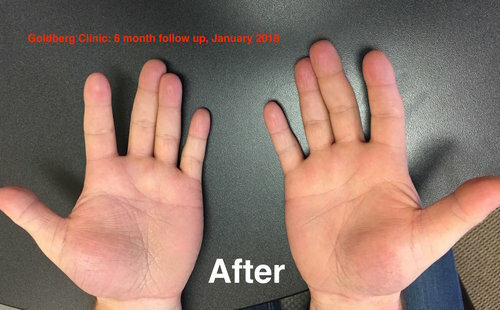 His case illustrates the important connection between the skin, the GI tract and the joints as these are often interrelated problems. As Nick's overall health improved, his digestion, skin and back pain improved simultaneously without the use of drugs, treatments and therapies. He is drug free. When causes are addressed, health is restored! Kristy presented with a variety of chronic health issues and dermatological afflictions. She had taken numerous drugs prescribed by her MD including steroids and ant-acids but her condition worsened over time. TJ presented with a severe case of Eczema and chronic digestive issues. His skin flared after taking a boxed "cleanse" he purchased from the health food store. After 4 months, TJ's digestion has improved considerably and his skin has nearly cleared entirely. In addition, he reports sleeping better, improved energy and a increased sense of overall wellbeing. I went in to the dermatologist for a routine check of moles, got zapped 47 times, with one biopsy. I was diagnosed with melanoma Feb. 2006. Dermatologist sent me on to a surgeon. In March I had radioactive dye injected for sentinel node spread, surgery, and lymph node removed. Thank God the melanoma hadn't spread. I had a small coin sized place on my forehead. I went back to dermatologist. Zapped 21 times said thought it was seboric dermatitis. Several months went by with no help or ease. Creams, ointments, prednisone. It spread on down side of face all the way to my waist. The itching was unbearable. I looked like I had been scalded. Starting out as coin sized round red spots. Also like I had dandruff of the entire body with scaling and skin falling off. In November doctor said it was contact dermatitis not seboric dermatitis. More prednisone and see allergist. Allergist said I didn't have a place to do skin test. More prednisone and lots of other medicine. By Nov 30 I was a lot worse. I went to a hospital emergency room in Atlanta and given medicine that made me see double and sent to another dermatologist that same day. He took biopsies, said possible PRP. Special shampoo, antibiotics, benydryl, etc. Dec 10 dermatologist said possible Pityriasis Ruba Pilaris a very rare skin disease. He prescribed methotrexate (which is for cancer) a very strong medicine. The next day I was even worse having trouble breathing. Stopped taking the medicine. Then at next doctor visit he wanted me to try it again. He said I needed to find another doctor. So did my internist so I was left without a doctor at all. I tried to get in with a professor of dermatology at a hospital and couldn't until I had sent in my records proving it was rare enough to be seen. I did finally get an appointment with an internist at the hospital, she immediately had me admitted to the hospital. After 6 days of tests biopsies, saran wraps, ointments, pet scans etc. the diagnosis was unclear, possible erythederma. I finally got an appointment in Jan. 2007 with a professor of dermatology at a prominent hospital in Atlanta. After more biopsies, blood work etc He said he thought it was PRP (a very rare skin disease) and they didn’t know the cause and it had no cure. He first prescribed soritane plus doxepin for the itching and atarax and pain medicine. After 4 days my hands were so much worse with layers of skin peeling. I went back to the internist and my liver enzymes were elevated. I contacted dermatology professor MD He took me off soritane immediately. Ointments and cortisones again. Nothing helped. In Feb. professor (MD) of dermatology said I could try enbrel injections a new drug that was for Rheumatoid Arthritis but it had shown some help with psoriasis and take a gamble it might help or it might not. The side effects were MS, TB, and lymphoma or I could just live with this PRP. At that time I was itching and this was over my entire body and unbearable that I thought willing to take the chance. I was suppose to get it in 10 days. My next appointment was one month later. The dermatologist professor asked me about the enbrel injections well, I hadn't got them. I was assured it would be taken care of. My next appointment was May 2007. I still hadn't got the enbrel and it was the last of April. I gave up on any help so I called cancelled all appointments. On the day of my cancelled appointment my Pharma Insurance Co. called and said they would be sending out the Enbrel injections today. I told them not to send them just keep em I made it this far without it and now I don't want it. That was one of the best decisions I made. about Dr. Goldberg a long time ago. Here are some pictures of before and after. You be the judge. Thank you Dr. Goldberg.